What did I let myself in for? I left it fairly late to start running as such with the main reason being that I had quit playing football (some might even ask if I ever started that) back in late 2005. So, how do you actually run? Well I set out for a few 3 or 4 mile runs two or three times a week and came back and asked myself what’s the point, sure I’m knackered. I remember a conversation with a guy in work who had done Dublin marathon and I remember saying, “Running marathons isn’t for me.” Before I knew it I was looking up training plans in the internet and managed to complete an online booking for Dublin marathon ahead of booking Belfast 2006 which would become my first marathon. 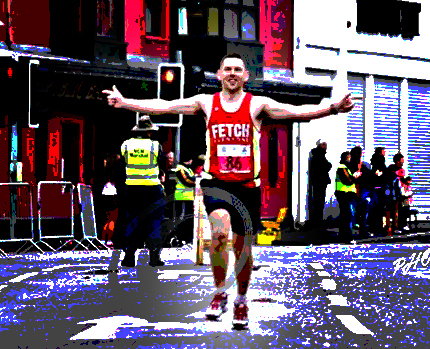 I booked Omagh half marathon just to see what it was like to be involved in a ‘race’, learnt a few lessons about pacing but for some reason I keep forgetting about them. 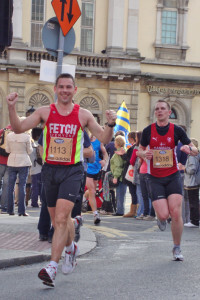 Later in 2006 I got my first taste of Longford marathon after being talked into doing it by a couple of mates who said ‘Sure you’ve done the miles anyhow, why not do a marathon’ hmmmm, hold that thought. Finished that year with my 3rd marathon and I think I may have caught the bug. It was also during 2006 I got speaking to a certain Mr O’Hagan who as well as giving some sound advice invited me along to St Peter’s running club. Having spent the last 18 years playing football and going to training twice a week along with a match on Saturday I wasn’t sure if a running club was for me, so I called in when I could (which wasn’t too often). Three marathons in the first year surely that would be enough for the following year apart from the fact my sister lives in Rotterdam and they just happen to have a marathon over there so I had to pay her a visit and just be pure luck the marathon was on the very same weekend. As well as having a great weekend I had an experience of a lifetime. There was to be a heatwave at the time of the marathon which started at 11am, ‘Englishmen and mad dogs’ come to mind. Race day turned out to be between 30 and 32 degrees. The marathon was stopped for anyone who hadn’t passed a certain point wasn’t allowed to continue as they would have been running in the heat for too long. After finishing my 4th marathon in my slowest time I got talking Brenda and arranged to meet her by walking away around the dividing fence. Everything was going well until I started to feel pins and needles in my fingers, something wasn’t right so I went to a first aiders standing around, this was going to be a problem without a word of Dutch but as it turned out I couldn’t even talk a word of English. After running 26.2 miles I ended up doing a few hundred metres in a wheelchair back to the first aid tent. Turns out that the main Doctor was from Co Offaly and his wife was an American who had recognised my accent, couldn’t have asked for better care. It was a great feeling getting the drip in, I could actually feel the fluid going right through my body. The Dr’s wife had also got in contact with my sister and family who arrived at the first aid tent just as I was getting ready to go. I was one of the lucky ones who recovered quickly, there were a number of runners who had been admitted to hospital and a few of those had to spend the night. The rest of the marathons that year were pretty uneventful after that. 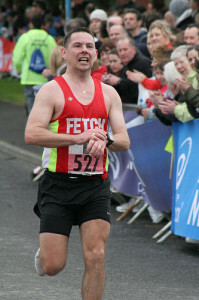 The following year (2008) I introduced a few new marathons to my list. Hello to Connemara (you have to do this at some stage), Newry and Cork along with the usual suspects. The first 4 marathons Connemara, Belfast, Newry and Cork seen 3 new Personal Bests with 9 seconds separating the 3 (Newry was the odd one out). 2009 seen me look to try and pick up the pace aiming to get as close to the 3 hour mark as my wee legs would carry me. Training started to get a bit more serious but as hard as I tried I needed to find (loose) another 6 minutes. Not to let the failed efforts get the better of me I set my targets high for 2010. I was able to find even more time to train, I had to if I was to get this target. If the truth be told the training started back in December 2009 allowing me 4 hard months training finished off with cutting back to a mere 192 miles in April as I tapered down ahead of Belfast. As part of the training I had entered a number of races to see exactly where I was in my quest for sub3, everything was looking good. All I had to do now was to go out and do it. I had planned my pacing knowing roughly what time I should have at certain distances. One of the most difficult things to do is to hold yourself back no matter how good or fresh you feel. A friend who I got to know through a running website ‘Fetcheveryone’ (where I log all my training) was also aiming for the sub3. As it turned out he passed me in the last couple of miles and gave a few words of encouragement. Needless to say it felt great to cross the line knowing that we both achieved our goals, mine in a time of 2:59:20. The down side to this hit me later when I realised I had done it and now what do I do? I had entered a few other marathons later in the year so they would be done but I took to triathlons, this resulted in my running miles being dropped to very low figures. I finished off the summer with Lap the Lough so with around 8 weeks to Dublin I again decided to set myself a target. Long runs were the order of the month with a total of 6 long runs in September before tapering down with a couple of races and more PB’s. For some reason I enjoyed Dublin more than Belfast even though I was a bit slower but still managed to squeeze a sub3 with a massive 7 seconds to spare. 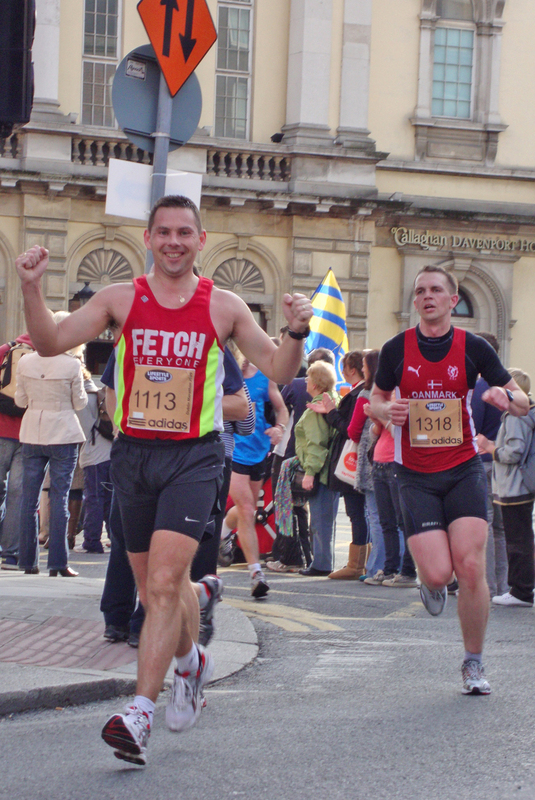 So Dublin was my 23rd marathon and I was starting to meet a few other runners at various races with ‘Marathon Club Ireland’ (MCI) vests/t-shirts on.